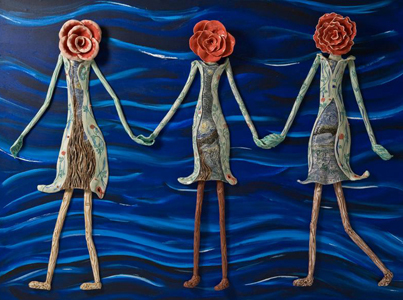 I created the “Rose Sisters” in 2010 for the Norma J. Vinger Center for Breast Care at Gundersen Health in La Crosse, WI. Inspired by my mother’s experiences during treatment, the Rose Sisters are designed to provide comfort and peace to the patients while they wait for treatment and for news of diagnosis. Greeting Rose welcomes people as they enter the Breast Care Center. She stands over 4′ tall. Her sunflowers shine brightly signifying the resilience of her spirit no matter what happens. Denise Rose is in the inner waiting room comforting those waiting for treatment. She is over 4 feet tall. 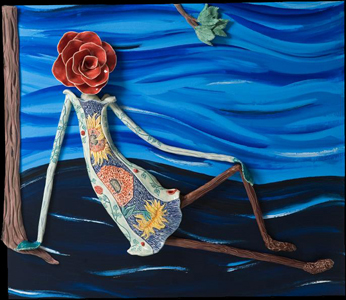 She has the first part of an interpretation of the well known ‘Starry Night’ depicting the mountainous climb she is just beginning. Even so, stars of hope shine in the dark night sky. Callie Marie, Kayla, and Karisa Rose walk together hand in hand helping each other get through the treatment process. They are each over 4 feet tall. These Sisters make it up the big mountain of treatment and through radiation leaning on each other since they are all in treatment at the same time. Sandra Rose is named after my mom. She stands over 4 feet tall in a stance that says, “I don’t want to be here, but I know I need to be, so here I am”. Sandra Rose also has the moon shining symbolizing a successful treatment. She has made it! On the green jacket you can see rose vines wrapping around Sandra. These symbolize the many professionals that work hard to make her treatment as successful as possible. These can be found on all the Rose Sisters but one. Sister Jean Rose is in a thoughtful pose while she stands in a treatment room. She is 3 feet tall. Her inner self remains bright and untouched by the treatment as can be seen by the Sunflowers. Katie Bea Rose contemplates defiantly as she is going to win this battle. She is 3 feet tall. Her Sunflowers are also bright. She is in a treatment room next to Sheila Rose. Sheila Rose is a 3 foot rose from head to foot. She sits in a procedure room creating a sense of calm during a difficult time. Patty Rose hangs high in a treatment room in perfect view for the patient. She reminds the viewer to remember the good things in life, even if they are small. She smells a rose deep in thought. Her Sunflowers remain bright. Ami Rose can be found in the family waiting room. She is 18 inches tall. Ami is showing all of inner thoughts and feelings to her family encouraging them while they wait during her treatment. As my mom is cancer free today, her legacy of inspiration continues through my Rose People who offer a sense of peace to those they see. I create Rose People to share feelings of understanding to those I cannot reach myself. My five hospital installations have the ability to reach more people in difficult situations and therefore are my greatest accomplishments. Being able to use the cognitive science I learned while achieving my Master Degree in Science from Northwestern is most satisfying. For the past 14 years I have lived in La Crosse, WI where I have an in-home studio and gallery.